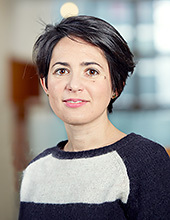 Helena Rodilla is Assistant Professor at the Terahertz and Millimetre Wave Laboratory at Chalmers University of Technology. She was born in Salamanca, Spain in 1982. She received the B. S. and PhD. Degrees in physics from the University of Salamanca, in 2006 and 2010, respectively. From 2006 to 2010 she was working in the Electronics Group in the Department of Applied Physics, University of Salamanca. During her PhD she worked on Monte Carlo simulations of Sb-HEMTs. During her PhD studies, in spring 2009, she was for three months with the Microwave Electronics Laboratory, MC2, Chalmers University of Technology, where she joined as a Postdoctoral Researcher in 2011 to work on very low-noise InP HEMTs for cryogenic LNA. From 2013 she is with the Terahertz and Millimeter Wave Laboratory, MC2, Chalmers University of Technology where she became Assistant Professor in 2015 and Docent 2017. Her immediate research interest is the study of the use of THz technology in life science Applications. Det kan finnas fler projekt där Helena Rodilla medverkar, men du måste vara inloggad som anställd på Chalmers för att kunna se dem.